Liberals Tweet Hateful Insults to Father of Florida Shooting Victim - Because He’s a Trump Supporter! Liberals Tweet Hateful Insults to Father of Florida Shooting Victim – Because He’s a Trump Supporter! Hateful liberals hurled insults to the grieving father because he is a Trump supporter. On Wednesday afternoon, 19-year old Nikolas Cruz went on a shooting spree at Marjory Stoneman Douglas High School in Parkland, Florida that left 17 students and faculty members dead. That afternoon a man named Andrew Pollack was photographed searching for his daughter, Meadow. 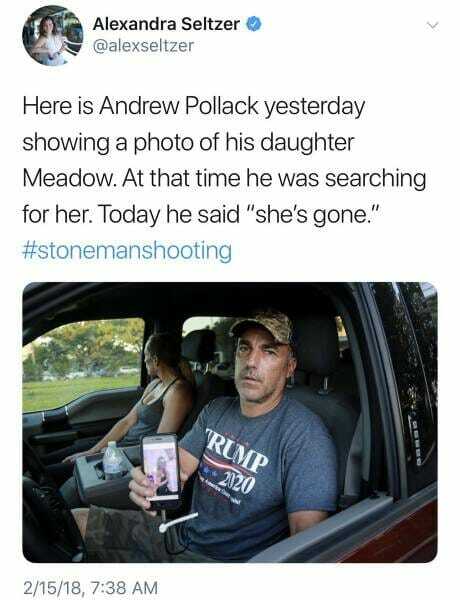 Thursday Pollack said, “She’s gone” after finding out his daughter was one of the students that was gunned down by Nikolas Cruz. 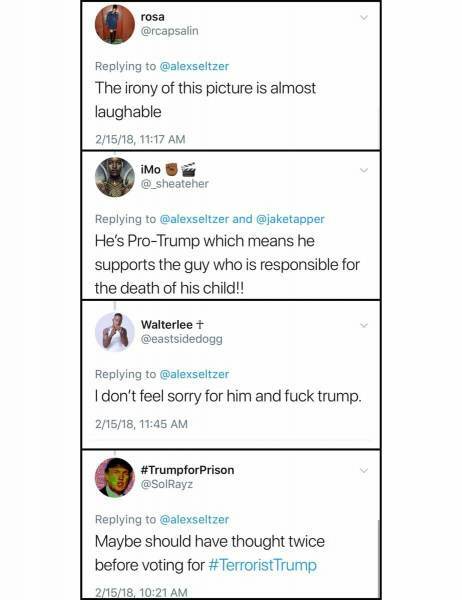 Some of the vile insults from Liberals include, “I don’t feel sorry for him and f*ck Trump” and “Maybe he should have thought twice before voting for Terrorist Trump” (screenshot below), the GP reports. Trump supporters responded to the hateful tweets. Did you vote for President Obama’s? There were school shootings on his watch too! Don’t make this political have a heart and pray for the families who are suffering at the loss of their precious child or family member like the coaches! God Bless You! So if what you are saying it is the fault of the President for this then Sandy Hook was Obama's complete fault and he was responsible for the death of 28 people. We did rethink our politics Trump is president. Liberals never stop with their hate. Rest in peace Meadow Pollack. Millions of Americans are praying for your family.